This distorted set of constellations is what our distant ancestors saw in the night skies of 20,000 B.C. Humans have always used the brightest stars to trace patterns in the sky, but those stars are generally our closest neighbors in the galaxy and those with the highest proper motions. We assume that the stars' positions in the heavens are eternal. But everything in space is in motion. As our Milky Way rotates, our sun is carried once around the galaxy every 250 million years, slowly drifting up and down through the galaxy's disk, like a horse on a carousel. The stars in the galaxy tug on one another gravitationally, which forces them to shift around. Astronomers know of many clusters of young stars that formed together and are now migrating through the galaxy as a group. And scientists can identify individual cluster members that have been ejected due to gravitational forces exerted by surrounding stars. For the most part, the motions of stars are not obvious over the course of human life spans. However, the constellations formed by stars have altered in appearance over recorded history. Additionally, several stars located close to our sun noticeably change their location from one year to the next, and skywatchers with backyard telescopes can watch the progress of these stars. Because stars can move in any direction in space, they can travel laterally (sideways), radially (towards or away from our solar system), or a combination of both those types of motion. Lateral motions change stars' coordinates on the sky, gradually rearranging our star maps. Astronomers can also measure the Doppler shifts of a star's spectrum to determine whether a star is approaching or receding from our solar system, but such radial motion won't alter a star's position in our sky. Proper motion tends to be very small for distant stars and large for closer stars, although even nearby stars can have a proper-motion value of zero if they aren't moving sideways. As instrumentation improved, astronomers found that some stars were changing their positions over time, so catalogs and charts had to be regularly updated and reissued — generally every five years. Eventually, star catalogs included the rate and direction that the stars moved. Nowadays, online digital star catalogs are hosted and updated by the U.S. Naval Observatory and other public organizations. Mobile astronomy apps and desktop planetarium software regularly download those catalogs and use the data to display each star in its correct position on any given date. Many of our 88 modern constellations have their origins in Babylonian astronomy. Around 1370 B.C., those ancient astronomers took note of the relationship between the seasons and the stars and created the earliest known star catalogs: the Three Stars Each list and the Mul.Apin, both of which survive as stone tablets. That knowledge was later passed on to the ancient Greeks, who laid the foundations of modern Western astronomy. The modern zodiac constellations — including Taurus, the bull; Leo, the lion; and Scorpius, the scorpion — first appeared in those ancient texts. In order to view the constellations in different eras, it helps to remove the foreground planets and local horizon — and disable daylight effects. This image shows the modern sky around the constellation Boötes with all of those elements removed. Long ago, the bright, naked-eye star Arcturus was much higher than the dimmer stars that represent the herdsman's legs. In the far-distant future, Arcturus will descend to sit directly between those stars! Due to the action of stellar proper motion over millennia, the constellations we see today are altered from the star patterns that the Babylonians saw. In most cases, the changes are barely noticeable, but a few are readily apparent. 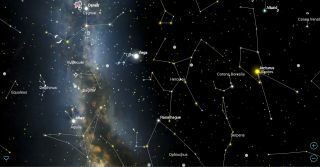 Advanced astronomy apps such as SkySafari 6, Stellarium Mobile, and Star Walk 2 allow you to view the sky in different eras, so you can travel back in time to see the ancient sky and preview the skies our descendents will enjoy in the far future. Some apps require you to manually enter the year that you'd like to see or scroll through the years sequentially. With SkySafari 6, you can easily jump through time. In this app, open the Settings menu. Under the Precession item, enable the Proper Motion option. (This change can be permanent. It won't affect your regular use of the app.) Under Coordinates, switch to Ecliptic. Under Horizon and Sky, disable Daylight and Horizon Glow and then disable "Show horizon and sky." For this demonstration, I also like to hide the planets. Make sure that the constellations' lines are displayed. Star names are optional. Upon exiting the Settings menu, your app's display will show a dark sky, without any obscuring horizon, regardless of the time of day. Search and select a constellation. Ursa Major is a good choice, because everyone is familiar with this constellation's Big Dipper asterism. Use the Center icon to hold Ursa Major in place, and then open the time-flow controls. In SkySafari 6, tapping the time-units box (located directly below the label for day of the week) opens a key pad you can use to change the time-step interval from the default value of 1. A time step of 1,000 years will reveal the slow wanderings of the stars when you tap the single-step or continuous-flow arrows — forward or backward. The familiar Big Dipper is an asterism within the larger constellation of Ursa Major, the Big Bear. The panel on the left shows those stars in the year 20,000 B.C. The panel at right presents them in A.D. 20,000, about 18,000 years from now. In the interim, the bear has changed quite a lot, but the dipper, although distorted, is still easily recognizable, because most of the stars that form it were born together and are moving through the galaxy as a cohort. While the app is configured this way, you can check out other examples of rapidly evolving constellations. Altair in Aquila, the eagle, and Arcturus in Boötes, the herdsman, are two bright, naked-eye stars that have relatively high proper-motion values (0.66 and 2.28 arc seconds per year, respectively). Two dimmer stars, named Tarazed and Alshain, flank Altair. In the modern sky, these stars form a bent line, with Altair in the middle — as if those flanking stars are the eagle's "ears." A thousand years ago, Altair sat directly between them, and in Babylonian times, Altair was "below" them, making the two flanking stars seem more like "antennae." Altair, the brightest star in the constellation of Aquila, is another wandering star. It also marks one vertex of the Summer Triangle asterism. From left to right, these three panels reveal Altair's motion from the time of Babylonian astronomers, circa 1300 B.C. through A.D. 1018, to today. Compare Altair's position to those of the flanking stars Tarazed and Alshain. All three are visible during September evenings. Arcturus is the very bright, orange star that sits at the base of the kite-shaped constellation Boötes. It's in the western early evening sky during September. The stars Zeta Boötes and Muphrid sit southeast and southwest of Arcturus, respectively, forming the herdsman's stubby legs. Arcturus is moving southward. Two millennia ago, it was much farther from those stars, and 3,000 years from now, Arcturus will sit between them — as if he's performing the splits! Barnard's Star is located in the constellation Ophiuchus, which can be found in the southwestern sky during September evenings. At a visual magnitude of +9.53, the star is near the limit of visibility using 10 x 50 binoculars, but a backyard telescope can reveal this star to you. Your astronomy app will readily show the rapid motion of Barnard's Star across the sky. The SkySafari 6 app's information page for each star includes details about any motion that star may be experiencing. The section titled Apparent Motion provides the east-west and north-south (i.e., R.A. and Dec.) components of motion, as well as the combined total. Barnard's Star moves 10.38 arc seconds per year across the sky, a small but significant amount. The inset photograph at right is a composite of five images taken from 2004 to 2008. The star also has a radial velocity of -106.7 km/s, which means that it is 3.367 billion kilometers closer to our sun every year. That's a bit more than the distance between Uranus and the sun. Set your app's time to about 9 p.m. local time. Use the Search menu to find Barnard's Star (other catalog names for it include V2500 Ophiuchi and HIP87937), and then use the Center icon to put the star in the middle of the app's display. Zoom in until the nearby bright star 66 Ophiuchi (or 66 Oph) is visible near the edge of the display. Open the time controls and tap the year to select that unit as the time increment. Now, when you press the arrow icons, time will flow forward or backyard one year at a time. Every year in the future, Barnard's star shifts toward the upper right, away from 66 Oph. When the astronomer Barnard measured his star in 1919, it was positioned to the lower right of 66 Oph. To track the motion of Barnard's Star yourself, try to find it in your telescope (a GoTo system will help) and sketch the star field around it. Every year or so, take another look and sketch the star field again. Eventually, its path will become apparent. Astrophotographers can image the star field and create a multiyear composite to show the star's motion. Barnard's Star is a faint red dwarf located in northeastern Ophiuchus, a few degrees to the upper left of the naked-eye star Cebalrai. The sky is shown here for 9 p.m. local time on Sept. 21, but this constellation is visible all through the summer and early autumn annually. The inset presents a detailed star field, with the blue circle representing the field of view through a backyard telescope at low magnification. In upcoming editions of Mobile Astronomy, we'll highlight some autumn stargazing targets, discuss how to use mobile apps to plan and log your astronomical observations, and more. Until then, keep looking up!